You might think I've had my fill of goat's milk in the last couple of weeks, after my widely reported goat's milk butter binge (which, by the way, is far from over). Well my friend, you're wrong. 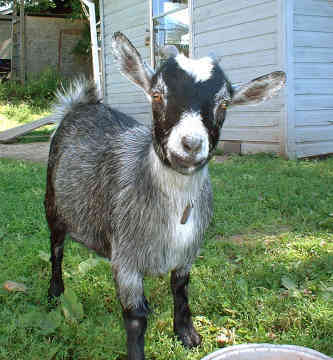 There's always room for more goat's milk in my life. Which is why, between tablespoons of butter, I've been able to put down a pint of goat's milk frozen yogurt. Since I don't watch Oprah (I know, I know, what's wrong with me? 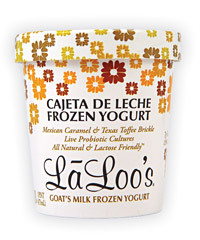 ), I discovered LaLoo's goat's milk ice cream at the giant farmer's market in Marin. Actually they were sold out of ice cream, so I discovered their frozen yogurt instead. First of all, it might be "probiotic," but don't fool yourself - it's really not that healthy. In fact, I was a bit bitter to find out that there are actually more fat/calories in the frozen yogurt flavor I bought (the Cajeta de Leche) than in any of their ice creams! But hell, I'm not eating frozen yogurt for the health of it, so I really didn't let that silly nutrition label stop me from powering through the pint. The Cajeta de Leche is essentially Dulce de Leche for the lactose intolerant - Mexican caramel swirled in vanilla frozen yogurt with bits of toffee added. How can you go wrong? What makes it unique, to me, is that it's actually a bit grainy; it's still creamy, dense, and very ice-cream like, but there's actually something I like about the fact it's not totally smooth and rich. Much like how goat's milk butter was lighter than its cow's milk counterpart, this frozen yogurt had a similar quality. Would I buy it because I'm trying to watch what I eat? Hell no! Would I buy it because it's delicious, and not just in comparison to other "low fat" options? Definitely. Luckily for me, unluckily for my diet, LaLoo's has 6 ice cream flavors, 3 frozen yogurt flavors, and sells their products at markets all over SF, including Bi-Rite, Rainbow, Whole Foods, and Andronico's. No, thank you for that pink of frozen yogurt! I have to pace myself with this one and not tear through it in 2 nights.